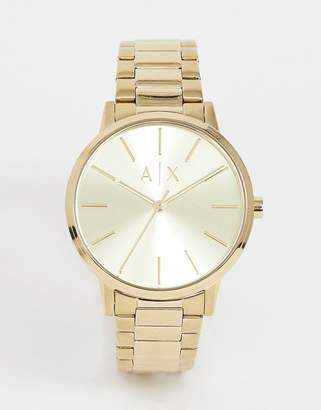 Watch by Armani Exchange, For when your phone's run out of battery, Stainless-steel strap, Three-hand movement, Dash indices, Single crown to side, Secure clasp, 5ATM water resistant to 50 metres (160 feet), Think showering and swimming, Presented in a branded box. One of the most iconic names in fashion history, Giorgio Armani launched Armani Exchange in 1991 as a youthful, sportier sub-label of his eponymous brand. Inspired by the laid-back street style Armani observed in his favourite cities Milan, New York, London and Tokyo the collection reimagines everyday staples across a range of clothing and accessories. Master low-key dressing from head to toe with its bags, watches, jersey and denim.